Motoajo Oy is a family company, whose experience in forestry contracting begun in the 50’s. As a result of organized development and patient growth, we offer job for 70 workers. 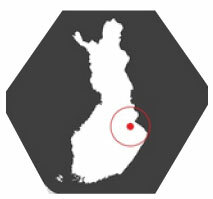 Our office is located in Nurmes, Eastern Finland, where we also mainly operate. When we log and transport roundwood and coppice, we always pay attention to the nature and operate by all means to protect it. Our vehicles are modern and made according to current emission standards. With harvesters we follow the Measuring Instruments Act with random sampling of tree trunks. All the vehicles are equipped with loader scales. Our aim is to work cost-effective and on schedule with professional staff and modern vehicles also in challenging environments, not forgetting safety at work. Our personnel consist of trained and experienced professionals. Drivers’ workmanship is constantly improved by taking part to courses of quality, environmental and work safety. Motoajo Oy has a comprehensive spare part stock and a service with professionals and vehicles. Company was awarded with certificates ISO9001 quality management systems, ISO14001 environmental management systems and OHSAS 18001 occupational health and safety management systems.